Good embouchure is difficult at first, because it requires constant thought. Once it becomes (a good) habit, the player can concentrate on other issues. 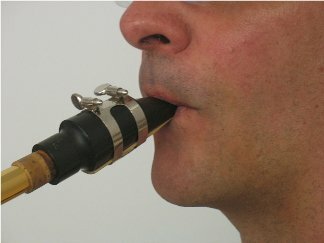 There are basic elements to the saxophone embouchure considered “text book”, but realize that every player has a unique physical configuration of the oral cavity that require a tweaking of those elements. Ultimately the goal is to achieve a good, controlled, in-tune sound. TOP TEETH, LOWER LIP, CLOSE, AND BLOW. That’s the embouchure boiled down to a 7 word sentence. Now let’s explore the components of a good embouchure in detail. The THROAT…must be open and relaxed. It is the first constriction the airflow will pass. What does an open and relaxed throat feel like? Make a “peace” sign, or “V for Victory” sign with your pointer and middle fingers. Now put the two fingers together. Put the fingers in your mouth vertically, i.e. the top teeth rest on the pointer or first finger, the bottom teeth on the middle or third finger. (Don’t put the fingers in too far or you’ll gag.) Next, breathe in and out through your mouth taking slow, deep breaths. Put your mind on your throat. Memorize how it feels, and reproduce that feel when you play. Try to have the back of your TONGUE down, which will help open the air channel. The tip is used for articulation. The CHEEKS should never be puffed out when playing. Think of your cheeks as being the walls of a hallway. Aren’t the walls vertical, and firm? Or are they bowed out, and soft? The oral cavity is the hallway the air must travel to get to the sax. You want the air to go straight, not sideways. Think of an “Uhh” syllable, and not an “Eee” or “Aaa” syllable. An “Ooo” syllable may cause loss of control, particularly in the lips. Your TOP TEETH are the anchor for the mouthpiece. Generally they go about a third of the way down the mouthpiece. (This depends on the type of mouthpiece as well.) Basically it is above the point where the reed just meets the rails. NOTE: Too much mouthpiece in the mouth will result in a spread out, bright tone prone to squeaks. Too little—taking just the very tip of the mouthpiece—will produce a stuffy, soft, uncontrolled sound. Unless you have the perfect exception to the rule, you will have one front tooth longer than the other. Some players prefer to have a rubber pad on top of their mouthpiece if the tooth is much longer than the other one. The LOWER TEETH should never touch anything! They should be as far away from the bottom of the mouthpiece as possible. In other words, the chin—or jaw—should be down. This primarily opens the oral cavity, which should be the case anyway. The UPPER LIP forms a seal on the top portion of the mouthpiece. The LOWER LIP forms the bottom section of the embouchure. It is a bit more important than the top, partially because it is in contact with the reed. The placement of the lower lip is usually near the point where the reed meets the rails of the mouthpiece. 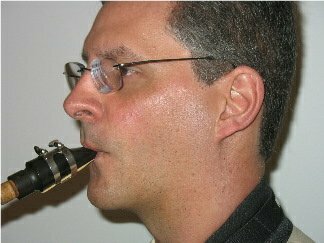 The lip should never curl out, or “straight up” as some clarinetists do. It should be slightly curled over the bottom teeth. (Not curled TOO much over the bottom teeth either.) It basically forms a pillow for the reed to rest on. Too much flesh on the reed prevents vibration, and depending on where the lip is can also cause squawking. In a good embouchure, the airstream should be directed straight down the neck of the saxophone. Try not to send the air higher or lower than the neck. A double lip embouchure has all the elements listed above, except the upper lip curls over the top teeth. This is not the best way to go, but it may solve a couple minor problems for some sax players. If the player has sensitive teeth, it could be very distracting having the top teeth on the mouthpiece. Sympathetic vibration gets transferred from the mouthpiece to the teeth, and then to the player’s skull. The quick answer is to place a rubber pad on the top of the mouthpiece. Sometime this helps; other times it does not. Also, when a rubber pad is used it changes the embouchure, because now the mouth must be more open than normal. (This could be used as an aid to opening the oral cavity.) Sometimes it can lead to some control loss. The upper lip seems to work better at dampening the vibration and offers more comfort to the player with sensitive teeth. BUT…the price paid is a slight loss of control when playing. This can be overcome to a degree with practice, but not totally. The saxophone embouchure differs with the type of sax. That is to say, the embouchure required to play a soprano will be very different from that of a baritone. There is even a significant difference between the embouchures of an alto and a tenor. While the mechanics of where to place the teeth and lips on the mouthpiece are consistent, the shape of the oral cavity and lip tension vary with the type of sax. The soprano will need a firmer embouchure with a slightly more "eee" syllable shape; the bari is much looser with a round "ahh" form. How much flexing or adapting of embouchure does the player do on each type of sax? Some minor flexing is at least required for adjustments to intonation. All sax types require the same tone qualities: An open, full sound; no pinch to the tone, especially above high G; and no squawking. A habit is a behavior that requires no thought. To make the mechanics of a good embouchure habit, the player must first think of it regularly. Playing etudes of solos with oodles of noodles and aerobatic melodic lines is the wrong way to go about it; the mind will be on the notes and fingerings instead of the face. Instead, go up and down scales SLOWLY. Whole notes, half notes, then with slow and steady quarter notes. Long tone studies are the best approach but can quickly become boring. So use scales and arpeggios, but use them with caution. It will do you no good if you tear through them and think you've got it! And practicing the embouchure studies once or twice won't be enough to establish muscle memory. Be patient...it will take days and days. But when you have a well established embouchure and no longer have to think about it while you're playing, congratulations--you'll have it! Also keep in mind that when you have a good embouchure, it must be maintained. These are muscles that must be exercised regularly, or they too will lose tone and you'll have to start all over again. When you stop practicing for even a couple weeks, the embouchure will be the first thing to leave you. And it will then take weeks to restore all that hard work you did earlier. There are other philosophies and illustrations of what constitutes a good embouchure. One of these is the concept of the draw string on a bag. As the draw string is pulled, the hole closes with equal pressure to a smaller circle. Another picture is that of a wagon wheel. The rim represents the lips with the spokes being the equal pressure of the lips holding the center. Yet another example is to go back and forth from forming a whistle with the lips to a wide smile. Now form both at the same time. This is a starting point to forming the embouchure, or at least letting the student feel which facial muscles are exercised while playing. A good embouchure is one of the fundamentals of playing saxophone. Good habits in this area are so much easier to develop than unlearning bad ones. A bad embouchure is easy to learn, true enough, but will take twice the time to lose than if you carefully made a good embouchure part of your sax playing from the beginning. The embouchure—good or bad—dictates what comes out the big end of the sax.